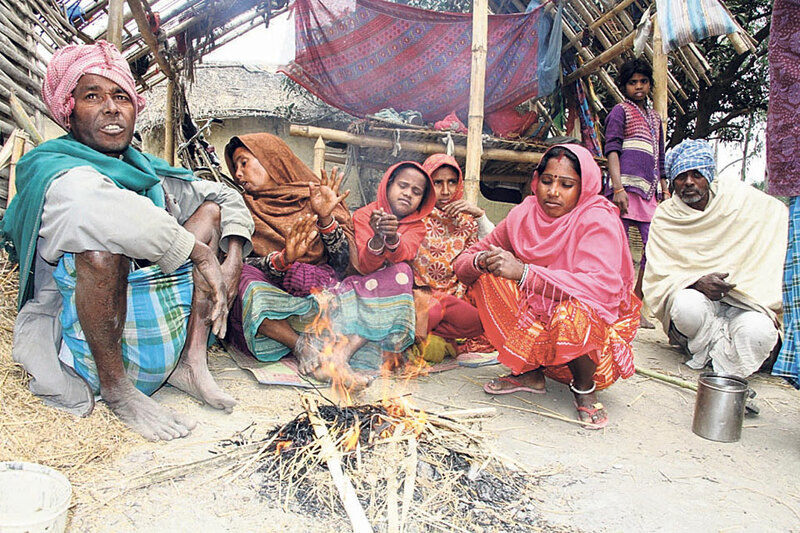 A family sits around a fire in Saptari in this recent picture. RAJBIRAJ, Jan 9: Every year, cold wave claims lives in Madhes and every year it gets sufficient space in the national media coverage. However, one thing that has fallen short so far, year after year, is that neither the government nor the locals come up with solutions for addressing the issue. Consequently, cold related deaths do not cease to draw headlines. Sporadically, civil society exudes fury against the scenario. The society puts the blame on the government as well as Madhes based political parties. However, this fury has not been able to address the winter blues of residents across the Tarai belt. The entire Madhes is currently reeling under extreme cold weather. Reports state that schools and colleges have been closed in some parts during the last two days. Many people from the poor and marginalized groups have been severely affected. Flood victims, who are living near riverbanks and in jungle areas in makeshift camps, have urged the government to provide them better residents. This year alone, 17 people have already lost their lives due cold in Saptari district. Following the toll, the district's administration office convened an emergency meeting to discuss the issue. During the meeting, the District Disaster Management Committee was requested to donate warm clothes and blankets to the needy, the forest department was urged to provide timber to the affected to wade off the cold weather. The meeting, however, is not something that has been convened for the first time. Meetings like the one are convened every year whenever the cold wave sweeps the district and takes its toll on the lives of poor people. Officials claim that the issue should be handled by adopting a long-term approach instead of solely focusing on short-term relief plans. “Until and unless a very well studied and serious long-term strategy is prepared and implement to save the people from cold, such tragedies won't stop from happening,” an officer at the district administration office said requesting anonymity. There is no exact data available on the average annual cold related death toll across Madhes. Bhagat stated that the government calls for meeting only to address emergencies but organizations are not approached to plan for avoiding such deaths. Bhagirathi Pandey, Saptari's chief district officer, informed that around 7,000 blankets have been distributed to poor people so far. However, he could not provide data on the number of cold affected families. “Incoming reports from several parts of district have stated that the cold has been intense this year, then the previous years. We are doing everything we can to address the issue,” he said. He further added that his office is in discussion with authorities concerned to provide immediate relief to the needy people. “Though the exact death toll from the cold is not clear, around a dozen people have lost their lives. With the cold increasing by the day, the toll is expected to increase,” he said. Dom, Mushahar, Baata and Dushadh are among the most disadvantaged communities in Madhes. Due to their poor economic conditions, these communities mostly fall victims to the extreme weather conditions. Even in monsoon, these people are the hardest hit.